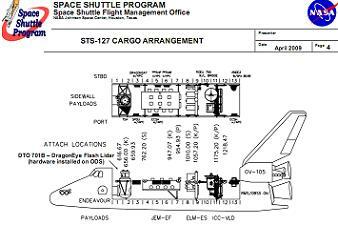 Due to a conflict with Shuttle Crew Scheduling Constraints (SCSC) rules relating to off duty time during flight, NASA managers have recommended an increase of STS-127 to a 16 day mission (16+0+2). The confirmation came via a PRCB (Program Requirements Control Board) meeting presentation, which also outlined alternative options. The mission length will be under review until the launch draws closer, due to MMOD risk numbers. Endeavour is on track to rollover from her Orbiter Processing Facility (OPF-2) on Friday morning, before rolling out to Pad 39B as part of the STS-400 LON (Launch On Need) requirement. “Final roll preps and forward and aft compartment closeouts continue. Rollover to the VAB (Vehicle Assembly Building) is scheduled for Friday morning,” noted Monday processing information on L2. “Preps for landing gear functional are complete. Landing gear rigging checks, NLG (Nose Landing Gear) strut pressurization, and landing gear door thermal barrier rework were all worked over the weekend. Landing gear functional is scheduled for today. Following the stand-down of STS-400 requirements – via the clearance of Atlantis TPS (Thermal Protection System) during the latter part of STS-125 – Endeavour will be prepared to roll to Pad 39A, ahead of her primary STS-127 mission, which is tracking a June 13 launch date. The STS-127/2J/A mission package includes the Japanese Experiment Module – Exposed Facility (JEM-EF) and the Japanese Experiment Logistics Module – Exposed Section (ELM-ES) as well as the Integrated Cargo Carrier – Vertical Light Deployable (ICC-VLD). Attached to the ICC-VLD will be six P6 truss batteries (which will be part of the P6 battery R&R activities during one of the mission’s EVAs), a Linear Drive Unit, Pump Module #2, and a Space to Ground Antennae – all of which will be transferred to ESP-3 (External Stowage Platform-3) during an EVA. In addition to these primary payloads, Endeavour will fly with DRAGONSAT (Dual RF Autonomous GPS On-Orbit Navigator Satellite), the MAUI (Maui Analysis of Upper-Atmospheric Injections), ANDE-2 (Atmospheric Neutral Density Experiment-2), SEITE (Shuttle Engine Ion Turbulence Experiment), and SIMPLEX (Shuttle Ionospheric Modification with Pulsed Local Exhaust). Due to the packed nature of the mission, managers discussed potential solutions to the SCSC rule breach, relating to off duty time for the crew. “Issue: The 15+1+2 Mission Duration does not allow enough time to accomplish the specified ISSP/SSP mission objectives and complete the required Crew Off Duty without an SCSC Violation,” noted the outline in an expansive PRCB presentation, available on L2. The issue had been known for some time, with several meetings utilized in an attempt to find get-wells in the flight plan. However, those evaluations failed to find a solution that worked with the previous mission timeline. “The Flight Plan was reviewed at several STS-127/2JA meetings including reviewing the: Order hardware is removed from the PLB (Payload Bay). EVA and Robotics flight day placement. Specific Robotics choreography. Estimated times for specific activities such as JAXA payloads. This left managers with two options; increase STS-127 to a 16 day mission, or remain at 15 days while reducing mission content – specifically the deletion of EVA 5. “15 Day Option: Maintain the 15+1+2 mission and reduce mission content. The recommended reduction is the deletion of EVA 5. Deletion of EVA 5 maintains all other mission objectives with a 15 day mission and eliminates the SCSC violation,” added the presentation. “Currently, all tasks on EVA 5 are deferrable from STS-127. “The JAXA MLI task is only deferrable until HTV. Additional EVA tasks based on 15A results are under consideration for STS-127 by the ISSP. “Currently E19/20 does not have a stage EVA planned between 2JA and 17A. A quick assessment by the lead FD indicates time is available if the ISSP added this requirement. Other solutions are more complicated and involve leaving hardware such as the ICC-VLD or JLE on orbit. The option of moving to 16 days allows for the crew to use parts of Flight Day 7 and mainly Flight Day 11 for off duty time, whilst keeping all mission content in place. “Increase mission duration to 16+0+2: This timeline meets ISSP/SSP mission requirements including: SCSC Crew Off-Duty Requirements. 5 EVAs (5 EVA Days, 6 Non-EVA Days between dock & undock),” added the presentation. “Return of the ICC-VLD and the JLE. Off-duty required for 16+0+2 mission is 9.75 hrs. 3.25 hrs of off duty would be placed on FD7. 6.5 hrs of off duty would be placed on FD11. The decision to move to 16 days allows for all mission content to be completed on a nominal timeline. The STS-127 crew have been informed of the PRCB decision. 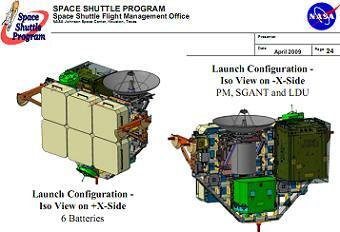 “Increase the STS-127/2JA mission to a mission duration of 16+0+2,” noted the recommendation. “This has been coordinated at the STS-127/2JA JOP, the 2JA ISSP IPT, the STS-127 SSP IPT, and with the STS-127 crew. “With a mission duration of 16+0+2 the EVA content will be 5+0. If a contingency EVA is required, EVA 5 will be deleted and used for the contingency at the required time during the mission. Options exist should managers decide to revert back to a 15 day mission, based on the latest MMOD risk numbers. “The PRCB decided to hold the full CR (Change Request) decision until the MMOD risk numbers are available to compare the risk for a 15 day mission versus 16 day mission,” added Monday’s 8th Floor News on L2.